These hi-tech heels and flats may look like high-fashion shoes but hidden on the inside is a technology that makes them as comfortable as sneakers! The team at Antonia Saint NY has created these amazing shoes with the objective of freeing the female and her feet. 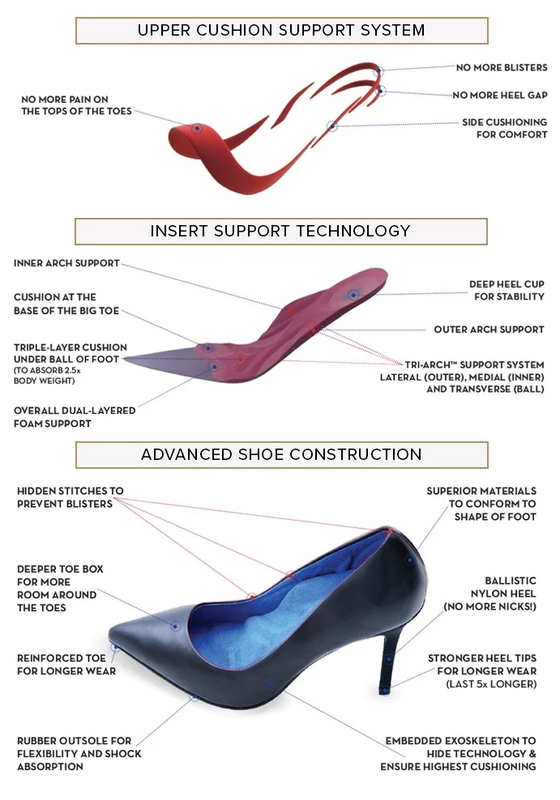 When industrial designers and professional shoemakers collaborate with an experienced foot surgeon, genius inventions such as these hi-tech heels are born. The idea behind these hi-tech heels is to create something that is classy and fashionable, without having to compromise on comfort. Women around the globe are all too familiar with the price they have to pay for standing a few inches above the ground, in the form of blisters, cuts, and bruises. These hi-tech heels provide the confidence of a powerful strut but do not leave the feet hurting for several hours afterward. The shoes contain ergonomically placed cushioning at various spots that are notorious for blistering and biting the feet. This insert support technology provides inner arch support, cushioning beneath the big toe, and a triple-layer cushion under the ball of the foot – features that your feet will thank you for. Additionally, these hi-tech heels also come with hidden stitches to prevent blisters and a ballistic nylon heel that offers greater durability than the standard heels. If you look closely at all the special features of these hi-tech heels, you will realize that these shoes are designed by women, for women, keeping every tiny detail of the feet’s comfort in mind. Be it a job interview or a critical presentation, women tend to put on a nice pair of heels to look their best but their energy and enthusiasm often get muffled by the pain that comes along with the shoes. With these hi-tech heels, women can march forward with confidence and shatter all the glass ceilings that come in their way. As stated by fashion magazines such as Vogue and Coveteur, your shoes are what complete your outfit and they should not be treated as an afterthought, especially in a professional environment. This is where these hi-tech heels will come to your rescue, with their classic design adding elegance to every outfit and their supreme comfort making them extremely practical for daily use. It is also common knowledge that no two feet are identical, which is why the creators of these hi-tech heels have also launched an app to find the perfect fit for your feet. The makers will use your foot measurements saved via the app to provide you shoes that are customised for your feet. Now you won’t have to use DIY hacks to make shoes fit better, just slip into these hi-tech heels and walk out with a spring in your step. These shoes come in a variety of colors and if you do not want to opt for the hi-tech heels, the brand also offers flats that come with a similar cushion technology. The patented SoftSurround System designed by the creators makes these hi-tech heels a pair of shoes that every woman must own. While the IndieGoGo campaign for these shoes has ended, these hi-tech heels will be hitting the shelves soon, so make sure to grab your own pair.